The word on word translation of Nohmai Farang is Westerner’s Bamboo. 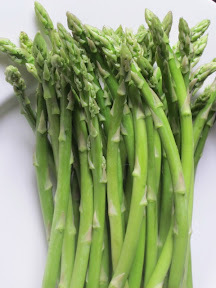 Maybe it’s because Asparagus is not originated from Thailand, but we learn how to eat them from western food cultures. Now we have asparagus all year round in Thailand. There was a noodle soup Restaurant in Ta yang, Petchaburi, they use asparagus in their noodle dish instead of bean sprouts. Asparagus has all the important Vitamins, low in Calories, contains fibers and rich in antioxidants. In Thai dishes, we Stir-Fry them with Shrimp in Oyster Sauce or use them as appetizer, wrapped in bacon.